A main goal of our general dentistry at Carolina Dental Arts is to provide preventive dental care for patients of all ages. That’s why we offer long-lasting, high-quality sealants in Glenwood South, Raleigh, NC, Goldsboro and all our locations throughout North Carolina. To learn more about sealants or to see if a tooth sealant would improve your dental health, contact your nearest dentist location. A sealant is a thin, plastic coating this is applied to the chewing surface of molars, premolars and any deep grooves in your teeth. These deep grooves are hard to clean and are very susceptible to decay. As more than 75% of tooth decay begins in these deep grooves, our sealants help prevent future decay and protect your teeth by sealing the grooves and creating a smooth surface that is easy to clean. 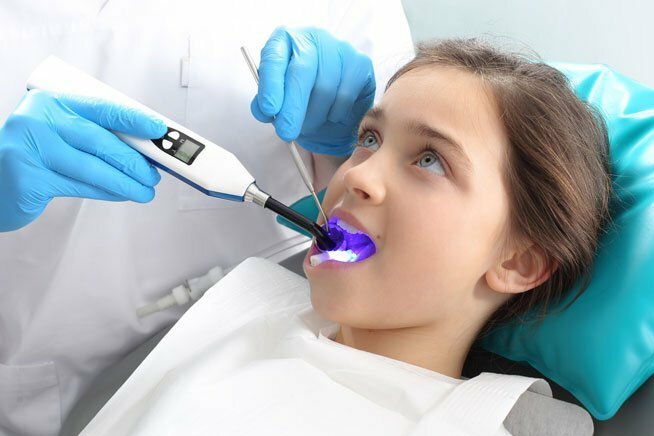 Why should NC patients get sealants? If you are a child or a teenager, you are prone to cavities as soon as your six-year molars (your first permanent back teeth) appear. Sealants help prevent these cavities. For adults, tooth surfaces without decay can still have deep grooves or depressions that can be solved with a sealant. Baby teeth can still occasionally need a sealant if the teeth have deep grooves or depressions and the child is prone to cavities. What is our sealant application process? When you visit Carolina Dental Arts for a sealant, one of our experienced NC dentists or dental hygienists will complete the procedure — each tooth only takes about two minutes to seal. We thoroughly clean the teeth that will be sealed and surround them with cotton to keep the area dry. A special solution is applied to the enamel surface to help the sealant bond to the tooth, then the teeth are rinsed and dried. Sealant material is carefully painted on the enamel surface and covers the deep grooves and depressions. Depending on the type of sealant, the material will harden automatically or with a curing light. No shots or drilling are required for a dental sealant. Taking care of your teeth at home, keeping a balanced diet, and regularly visiting the dentist will extend the life your sealants. Like all of our treatments offered in NC, sealants at Carolina Dental Arts are done with skill, care and precision. The next time you’re visiting your dentist, ask us about sealants and if they are a solution to maintaining the health of your smile, or contact us today with your questions.